“NOIR: The 3D/4D Semi-Cinematic Satirical Thriller” Opens September 12! Recently I learned about a new satirical theater show that not only pays tribute to theme parks but parodies it as well! On September 12, 2018 Noir: The 3D/4D Semi-Cinematic Satirical Thriller opens at the Eagle Theater in Hammonton, New Jersey. This completely original show will simulate a theme park 3D/4D experience in a regional theater and it sounds fantastic! I recently got a chance to chat with the creative director of Noir, Ted Wioncek, about what the process has been like creating this one-of-a-kind production. 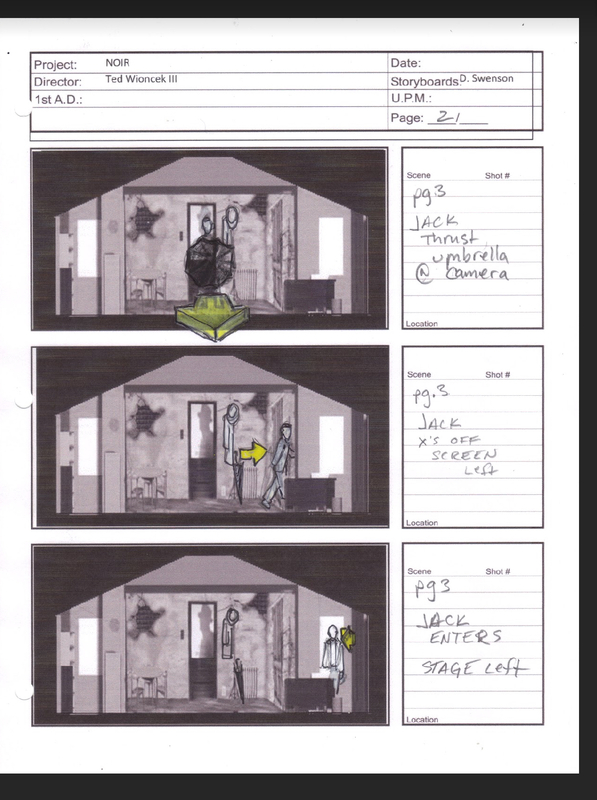 He even shared some exclusive production photos and storyboards of the process! Enjoy! Tell me a little about the show and why did you choose this topic: It has always been my desire to expand the medium of live entertainment, with an emphasis on experiential theater. That is what Walt Disney did in his own way; He took the medium of cartoon, known for gags and gimmicks, and gave the world Snow White and the Seven Dwarfs, a heartfelt story with an arc so palpable, audiences, for the first time, would feel empathy for an animated cast of characters. Empathy is a gateway emotion of making the audience more than just a spectator. In a similar vein, this new brand of live entertainment, Theme Park Theater, uses immersive and interactive in-theater special effects to put the audience in the center of the story. I chose film noir as our foil because it is distinctly stylized. The more rooted the genre, the more opportunity it presents for metatheatrical undertones. Satire, on the other hand, allows you to paint with broad strokes a wide range of hijinks and hilarity. I do believe the most effective satirical material derives from a place of adoration. We found humor in the tropes we appreciate most. What kind of in-theater effects are you utilizing for the experience: NOIR: The 3D/4D Semi-Cinematic Satirical Thriller is a one-man comedic tour de force. Throughout the entirety of the production, one actor portrays over ten outrageous characters as he interacts with himself on both stage and screen. This live-action production features 3D projection and 4D immersive and interactive special effects, including; wind, mist, scent, bubbles, seat sensors, and more! What other similar shows inspired you to create this: I am heavily inspired by Walt Disney, the Imagineers of past and present, and the entire theme park industry at large. The Themed Entertainment Association has done such a magnificent job at cultivating and celebrating this wonderfully supportive community. Naturally, everything from Captain EO and ExtraTERRORestrial Alien Encounter to Muppet*Vision 3D and Alfred Hitchcock: The Art of Making Movies has helped bring this art form to the surface. But, perhaps what has left the most profound impact on has been the audience itself. Audiences have a way of making it clear as to what they want. As an Artistic Director, I have had the fortunate opportunity over the years of sitting in the back of the house, night after night, production after production, observing response. I have witnessed firsthand what engages them, draws them in, and brings them to the edge of their seats. The audience, unbeknownst to them, has provided vital information. In this case, they have presented us with the key to dazzle each of their senses and delight them to their very core. What has the process been like creating the show? In 2015, as I was still developing the concept, I reached out to Tim Rinehart to play the role of Jack Sloan, the world’s worst private detective. Having worked with Rinehart on several projects, I knew his impeccable comedic timing and a knack for portraying a multitude of characters would fit this endeavor exceedingly well. I told him “I’m looking to create a film noir satire… you’re my PI.” He said he was interested and asked if he could take a stab at writing a bit of sample dialogue. I agreed, however, never let on that I planned to create this as a 3D/4D experience. The next day I awoke to a full twenty-page treatment of a classic noir satire. The tonality was spot on. I called Tim immediately and told him that we would agree to use his script if he agreed to play all the roles; the detective, the femme fatale, the girl Friday, the fall guy, all of it. I think he may have thought I was joking! But, after some convincing, we set a plan in action. Concept and in-theater effects. Our hunch was that a stronger script would arise should it be written as a multi-actor piece, with no outside influences. By doing so, any additional theatrical elements would only heighten the narrative. The experiential aspects would come later, long after the plot and characters had been developed. This approach allowed the writer to write and remain honest to his intent. It also allowed us to illusioneer elements that would work naturally with the source material, rather than shoehorning. After the story was fully developed and approved, we took pen to paper and began to transform it into a piece of Theme Park Theater. The process of creating NOIR: The 3D/4D Semi-Cinematic Satirical Thriller been exhilarating. 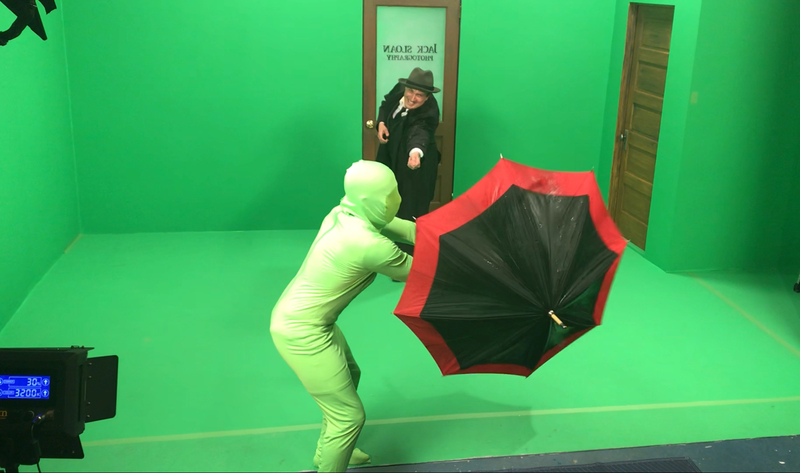 The backstage warehouse of the Eagle Theatre has been transformed into a green screen film set and production elements have undergone intense research and development. The last two months have been spent on set, filming the on-screen scenes and characters. Today, we are in the studio recording VO of the PI’s inner monologue, which he outwardly argues with throughout the show. In a few days, we will be implementing an original score with a jazz quintet. Next week, we are onto the stage! I have learned that my job as the creator is that of a storyteller. Not just for the sake of presenting something in front of an audience, but for everyone involved in bringing the art of show to life; from designers to investors. In many ways, the most important part of my job is assembling the proper team to tell this story. When you tell the story correctly, you naturally guide everyone to sharing in one collective vision. We suddenly all know exactly what the piece is, wants to be, and speak one universal language. Only then can we form an assembly line of endless possibility. What do you hope the audiences take away from the show? I had just turned five the first time I visited Walt Disney World. I remember riding Pirates of the Caribbean seven times in a row and having a plethora of vivid dreams, starring The Haunted Mansion’s Madame Leota and the Pepper’s Ghost illusion, for years thereafter. I can still close my eyes and recall exactly how it felt to encounter these majestic lands for the first time. I’ve come to realize that these are my first true childhood memories. Almost thirty years later and these visions continue to inspire me to this very day. That is what I truly wish to create for an audience, escapism; a world so viscerally intoxicating that it gives your imagination permission to set sail and never return. A part of me always knew I wanted to spend my life creating worlds that may not last forever, but who’s memories would never fade. This show sounds incredible! We will be sharing more from NOIR: The 3D/4D Semi-Cinematic Satirical Thriller in the weeks ahead. 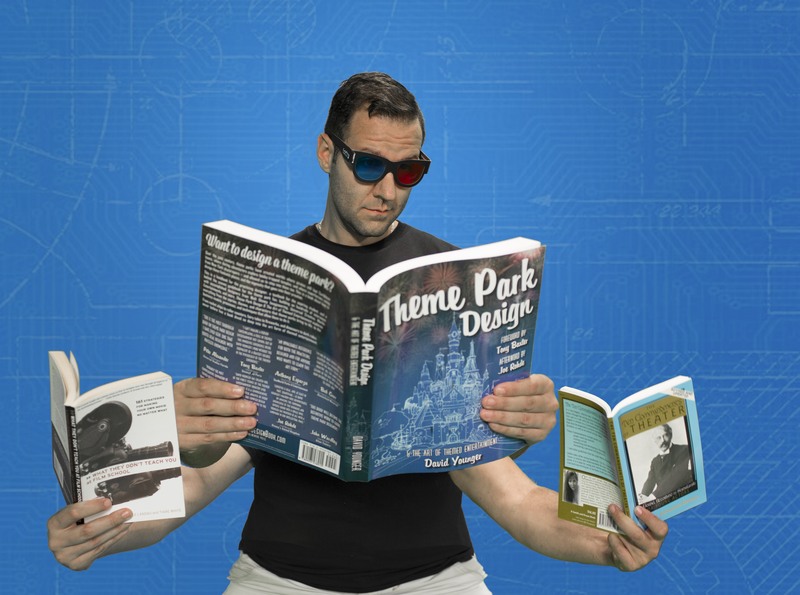 The Eagle Theater is also offering a discount to all Theme Park University readers! If you use the code “ThemeParkTheater” when purchasing your tickets, you can save $5 off the regular ticket price! Click here for more info! If anyone attends this show, I’d love to hear your thoughts! This entry was posted in Outside The Parks and tagged Eagle Theater, NOIR: The 3D/4D Semi-Cinematic Satirical Thriller, theme park design, Theme Park Theater. Bookmark the permalink. Trackbacks are closed, but you can post a comment.